I love it when you get a gift out of nowhere. 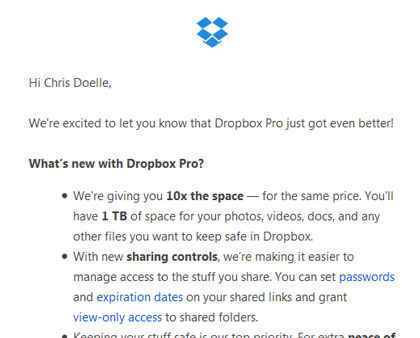 Dropbox has just done that. Instead of the 100GB I was at on my Dropbox Pro account, it turned into 1 TERABYTE today!!! No extra cost. I have been a fan of Dropbox since I started using the free version. The ability to increase my storage space by inviting friends really helped me out as they just kept adding space. It didn’t take long however for the space to run out – I guess you could say I am a power user when it comes to cloud storage. You can imagine my pleasure at reading an email (right) from Dropbox this afternoon announcing that my storage increased 10X!! Thanks Dropbox. This is a good service that I cannot recommend enough.